all kinds of application related problems. Yes, charging curves of smart chargers including ENC series, RPB series and RCB series can be set and adjusted through SBP-001, the charging programmer. SBP-001 utilizes the software with the connection between the charger and itself to allow users to programme charging curves. Charging parameter adjustment: Values of constant current (CC), constant voltage (CV), float voltage (FV) and tapper current (TC) can be set and adjusted. Battery temperature compensation: Various charging voltage compensation is provided for battery at different temperature conditions. Timeout setting: Fully programmable timeout during stages enables to be set to shutdown the charger to prevent battery over-charge. Following video is an example of demonstrating the ENC-120. Nowadays, customer implement magnetic component in their system to achieve fast installation and maintenance. The magnetic component should keep as far as possible from PSU to avoid interference in the control circuitry of PSU. If limitation of distance is unavoidable, install a well magnetic-conducted metal plate (ex: steel plate, copper plate) between PSU and magnetic component to minimize the interference. How to choose a suitable power supply for a charging application? MEAN WELL has launched ENC, HEP-600C, GC, PA, PB, RPB and RCB series for battery charge applications (30~360W). However, if these models still cannot fulfill customer’s requirements, there is an alternative for the purpose. Power supplies with constant current limiting as overload protection are suggested. Charge current varies in battery percentage (full or flat), there is high possibility to trigger overload protection when battery is low, those with overload protection as hiccup or shutdown will stop charging the battery in low battery condition. Yet, using a power supply as charging purpose is considered as over load usage, modification is required. Please contact MEAN WELL for the request. what are the applications for PSUs connected in series? (2)Increase the output voltage (current does not change). If there is no reverse blocking diode in the power supply, we should add an external blocking diode to prevent the damage of power supply while starting up. The voltage rating of the external diode should be greater than V1+V2. Transit current rating of diodes shall be greater than rate output current of S.P.S. output voltage and wiring impedance should be small when operating in parallel. as in picture below (some S.P.S. require a minimum load after paralleling). 2. Output voltage difference between S.P.S. units should be as small as possible, normally < 0.2V. 3. The power supplies should be paralleled with short and large diameter wiring together first, and then connected to the load. 4. After paralleling, the maximum usage of total power should be around 90% of the rated total power. 5. When power supplies are paralleled, if the load is lower than 10% of rated load of individual S.P.S. The LED indicator or signals (Power Good、Pok、Alarm Signal) may malfunction. 6. To ensure that the load current is effectively shared in parallel operation, in general, it is recommended not to use more than 4-6 power supplies at one time. 7. In some models, the +S, -S terminals should be used to reduce unstable pulsation of output voltage. Noise is directly related to the fan which is build into the power supply. Lowering the airflow of the fan means reducing the heat dissipation ability. It will also influence the reliability of the products. Furthermore, minimum airflow of fans is defined by Safety Organization and a safety appendage will be needed if using a new fan. If fan noise is a critical concern, we suggest to select FANLESS products or contact MEAN WELL for other possibilities according to the conditions of use. At input side, there will be a large transient inrush current during the power on of an SPS. The inrush current is usually of 20~100A based on the design of SPS, which will last for 1/2~1cycle of AC input (ex. 1/120~1/60 seconds for 60Hz AC source). Every breaker or fuse will actually have its own time-current (V-I) characteristic curve. Users can choose a breaker or fuse which has a rated current just over input current of SPS and check whether the V-I curve of the breaker or fuse can withstand the high inrush current from the SPS with a maximum duration of 1 cycle of AC input (e.g. 1/60 second). All MW chargers are designed for lead-acid batteries. Every Lithium battery or other type of battery will have its own charging/discharging characteristic. Modification will be required for MW's charger in order to match the profile of each battery or users' requirements. Please contact your local distributor if you would like to have a modification for your own battery. For a particular LED lighting design, each LED strip consists of 12 LEDs connected in series (VF=3.5V), 4 strips in parallel, and each strip requires 0.7A of drive current. Based on the above conditions, how do you select a suitable power supply? First of all, the LED power supply must be able to work in constant current mode. LED forward voltage of each strip = 3.5V X 12pcs = 42V LED lamp total current requirement = 0.7A X 4 strips in parallel = 2.8A LED power requirement = 42V X 2.8A = 117.6W LED power supply’s rated voltage/power should be greater than what is required but should be as close to the actual requirement as possible. Use 48V/150W as the basic criteria to pick LED power supply then make sure actual voltage/power usage meets constant current region and PF>0.9 specifications (117.6W/150W = 78.4% > 75%). CLG-150A-48V with output current set at 2.8A can be used in this design. Note: Each LED production lot will fall within a VF rank (e.g.3.4~3.6V). This LED tolerance must be taken into consideration during design. Same LED configuration as in question B1 with the exception of additional driver ICs. What is a suitable power supply unit to use? The startup voltage of such driver IC is significant lower than the total LED forward voltage. For this reason, the IC will start up at very low voltage level usually about 1/2 of the power supply’s rated voltage and to meet rated power requirement, the startup current will reach 2 times the power supply’s rated current. When the power supply is unable to provide this current, the LED CC driver will not activate. If the selected power supply voltage is significantly higher than the LED forward voltage. For example, power supply provides 48V and the LED lamp only needs 24V and the power ratings are equivalent. When power supply voltage reached the LED conduction voltage, the power supply will immediately go into constant current mode. At this moment, the required power to start up the LED + driver is larger than what the power supply can provide causing malfunction of the driver circuit and the power supply to be clamped at LED forward voltage. 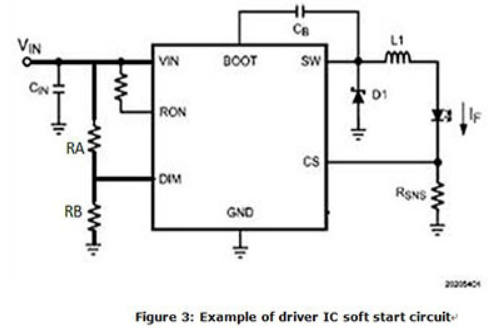 For boost mode design, we recommend raising the startup voltage of the driver IC to be as close to the power supply voltage as possible or incorporate soft start function (see fig. 3). Wait until the power supply voltage is established before starting the driver. When selecting power supply for buck mode, the output voltage of the power supply should be as close to the LED total voltage as possible with excess power available (LED power/0.85). DIM PIN is the startup pin for most PWM based driver. It can also be designated as EN (Enable). DIM (or Enable) is at 0V the internal connection to SW pin will be open. When the DIM voltage reaches 1.5V (Typ), the IC will Turn ON. To set the Vstart for the DRIVER IC: Vstart = (VDIM/RB) x (RA+RB). The general rule is to set the Vstart at 5~10% higher than the total LED forward voltage. Can LED power supplies be connected in parallel? MW LED power supply does not have parallel “current sharing” function so it is not suitable for parallel connection. For high power requirement, please select higher wattage power supply or divide LED load into smaller subsections to be powered by individual power supplies. Example of such LED configuration can be found in figure 5. As shown in fig. 5, the connection between -V of the LPC-35 units should be severed and not connected in common. On the contrary, small wattage LED loads can be connected in parallel and be powered by a single high wattage power supply. But, the ability to divide current evenly must be taken into consideration. What surge level can MW LED power supply withstand? Among MW LED power supplies, CEN/ CLG and HBG, HLG, HLN, HLP, HVG, HSG have the highest surge capability. It can withstand heavy industry level of 4kV. If higher level is required, external ZNR (470V) or gas tube (500V) can be added as shown in figure 8. But, overall safety compliance must be taken into consideration. For application with numerous lamp sets, a SPD (Surge Protection Device) can be installed to meet surge regulation requirements. Can MW recommend the dimmers compatible to the 3 in 1 dimming circuit? 3 in 1 dimming is the most commonly applications used in LED dimming with the feature that it does not have to work with any specific dimmer. The only thing that has to be verified is that whether the dimmer (1~10V/10V PWM/resistance) is compatible with the definition advised in our specs. Which model should we select when attempting to dim a LED strip? Generally speaking, LED strips would be connected with resistors in series, so the LED must be driven in CV mode. 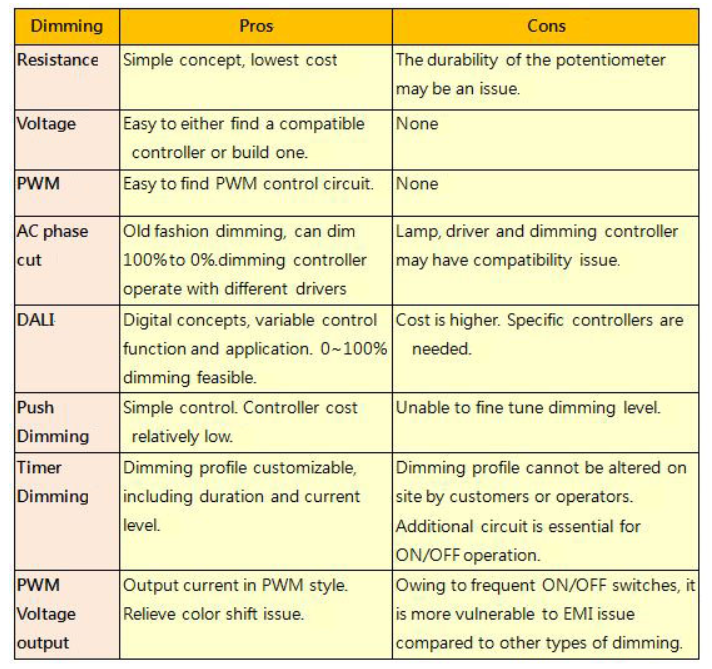 We will suggest those models offering CV dimming to be adopted, such as PWM series. How can we learn how many units of the model with 3 in 1 dimming can be controlled by one dimming device? 3 in 1 dimming circuit would drain 0.1mA per model. Dividing the rated current of the dimmer by the 0.1mA, and we could know how many units can be controlled by one dimming device. For resistance dimming applications, resistance for 100% dimming output would be 100K ohm divided number of models. Can we use LED CC model as a charger? MW has several charger products, and we suggest choosing them first. Chargers would be more suitable since they are designed for charging applications. Safety & Approvals should be taken into account. If you really cannot find a proper model in our chargers series, our LED CC models can be used as charger. Please choose suitable products after confirming the current and voltage specification on the datasheet of the battery. There are so many MW dimming products. How can I make a choice? What are the pros and cons? First, you have to know your Led lamp specification in order to screen out a suitable Led driver range (Wattage, Voltage, Max Current CC or CV). From those ranges, further check a compatible dimming function. Hereunder is a table to show you the pros and cons of Dimming Function you can find in MW's catalogue. Can I use MW LED drivers at full load continuously? Most of the AC/DC power supply are suggested to use at 70% load. LED Drivers are recommended operate at full load as long as it observes the working temperature specified in the datasheet, which means Tc measurement results should be equal to or less than the stated Tc in the datasheet. 5 years warranty complies as long as drivers operate within working Temp and Tc. Limit as well. Can I wire LDD or LDH in parallel or series? LDD/LDH series comprises switching components; series or parallel connection will damage these switching components. How long can I extend DC cable of the driver? Owing to line (voltage)-drop, we suggest the extension made from AC cable. In case DC cable extension is necessary, please consider Line-Drop leading to insufficient Vf so that the LED model or lamp may fail to switch ON. Moreover, EMC performance and characteristic may also be affected by DC cable extension. Why is that during LED power supply operation the LED sometimes varies in brightness or flickers? This topology does not use input bulk capacitor. For this reason, in areas with low AC quality, output voltage and current may become unstable causing variation in LED brightness. If the input AC voltage is stable then this problem will not occur. This is also caused by lack of input bulk capacitor. 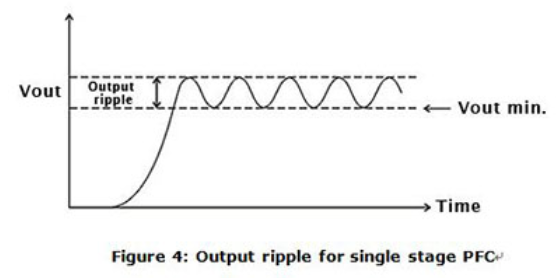 As compared to power supplies using dual stage PFC, the ripple will be significantly larger (see Figure 4). There could be instances where the low end of the ripple may be too low for the driver IC to operate properly and the LEDs will start to flicker. To solve this type of problem, the output voltage can be adjusted higher so the low end is higher than the driver’s minimum working voltage. Or simply select a PSU with higher rated voltage. Single stage PFC power supplies are optimize for constant current drive. Using these supplies as constant voltage sources (such as application including cascading a constant current driver IC), the harmonics might be worsen in this case. When operating in areas with unstable utility voltage or with driver IC, we highly recommend using general application types as found in table 1. Avoid using single stage PFC if possible, or contact MEANWELL. I cannot do dimming with MW LED drivers?? Why?